When I was a kid, the idea of ferns being edible boggled my brain. Ferns, those ornamental houseplants growing atop one of our walls? But they seemed so tough! It wasn’t until years later though, while vacationing in a friend’s home in San Pablo, Laguna was I able to try it. Pako, aka fiddlehead fern, have tender, young shoots that are so nicely crunchy. Drizzled with a sweet vinaigrette, it makes for a really refreshing salad. Here, I pair it off with sliced tomatoes and itlog na maalat (salted eggs). Well, actually, just mostly the egg yolks of the itlog na maalat. I find the white part a bit too salty for my tastes so I usually skip it, taking just the rich, velvety yolks. Aside from the pako, tomatoes and salted eggs, I also have rice and pan-fried SPAM. I cut the SPAM into flowers, using steel vegetable cutters then garnished them with some pako fronds masquerading as leaves. And no, that small amount of SPAM is not enough for me! What I did was hide some more, plus the leftovers I cut the flowers from under the rice. That way, I get to satisfy my appetite, while still maintaining a pretty lunch. Pako and Arosep! Somehow, they’re always lumped together in my brain. You cannot have! But they’re uber awesome aren’t they? You can lock them together for transport and take them apart for ease of use. It’s the best thing I bought in HK last year—a big deal considering I bought lots of doll stuff too! where do you buy the pako? We buy ours at the wet market in Alabang. I’ve also managed to buy some from those weekend organic markets like Salcedo and Legaspi. I’ve yet to find it in the supermarket though. I bring food to work now! 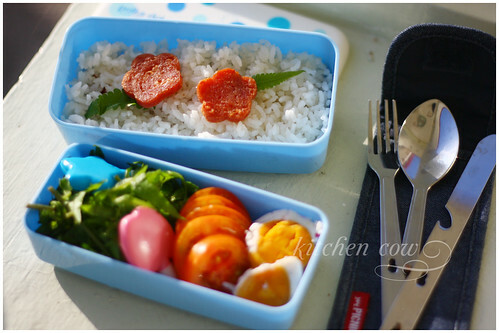 I can start doing my own bento boxes However, I can’t find any egg-shaper here in the Philippines. I want those cute sauce holders too. HELP! Hnnn…is there a branch of My Dollar Store near you? The one in Alabang still has some in stock. If you can’t find any, I can buy for you then just ship it off. Private plurk me? Ensaladang pako is soo good at Palaisdaan restaurant in Quezon. I’ve been wondering where I can buy it in Manila. Thanks for sharing! I’ve bought some from the wet market in Alabang, but if that’s too far, I remember also buying some from the Salcedo Saturday market.